Hooray for the weekend! It's been a really busy week, and I can't wait for some down time this weekend. Do you have any fun plans? Today I'm sharing our $2,300 kitchen makeover at the Roomspiration Kitchen Linky Party. There are a lot of beautiful kitchens on display, so head on over and check them out. Our $2,315 budget included new appliances, countertops, flooring, faucet, paint, hardware and backsplash tile. I ended up taking off two cabinet doors to create an open shelving look, and it has been a beautiful and functional part of our kitchen since the makeover. I know there are a lot of people who don't like open shelving, but I really love it in my kitchen. Just like everything we've done at our house, we wanted to give the kitchen a fresh look without overdoing it and pricing ourselves out of the neighborhood. 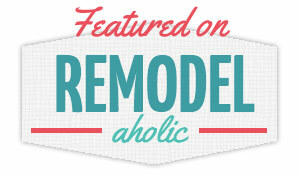 We don't see this house as our forever house, so we try to keep resale value in mind with all renovations. The buyers at our price point don't expect to see granite countertops, so we went with a great laminate counter instead. That decision alone saved us thousands of dollars in material and labor. The biggest splurge was the backsplash tile, but it was so worth it! This link will show you a full cost breakdown of the kitchen, as well as a source list. I hope you have a wonderful weekend ahead! I think we're going to spend some time working on the landscaping (which has been woefully neglected), and hopefully we'll get a few projects done inside the house. Tonight I'm taking my best friend/new roommate to Scott's football game so she can get her first taste of Texas high school football, Dallas-style! Enter the drills teams with the sparkly hats and cowboy boots, fog machines, amazingly loud air horns, huge marching bands with elaborate props and football moms with big hair and rhinestone-bedazzled jerseys. It's quite a spectacle. Can't wait!